With time, the legend of Kishore Kumar grows bigger. Thirty years after his death, it seems he is more popular than ever before. On HMV India’s list of the Top 10 songs bought online, seven are his. On Apple’s iTunes, his ‘Best of Kishore’ is currently third on the list of top downloads while in their Top 100, there is no other Indian male playback singer. These numbers corroborate what HMV India told Manu Joseph a few years back: Kishore Kumar sells more than the next three legendary Hindi film playback singers combined! His voice is called golden, and this verdict is subjective, but his ability to emote lyrics is probably unmatched; his voice and style, ever youthful, haven’t become dated. His songs, right from the 1950s, remain ‘current’. Listen to “Aye Haseeno Nazneeno” from Chacha Zindabad (1959), and you might agree. But Kishore is more than just that ‘golden’ voice. His legend is magnified by his persona — his eccentricity, his dancing, his acting, his craziness, his four beautiful wives, his amazing live shows, bits and pieces of which are available on YouTube. Shah Rukh Khan says he has a regret — that he couldn’t “breathe the air Kishore Kumar was breathing” in a room; director-choreographer Farah Khan wishes she could direct Kishore in a dance — and she’d only “sit back and enjoy”. Sachin Tendulkar says he loves him, Virender Sehwag, calls him his “hidden batting partner” since he’d hum Kishore’s songs while batting. When Junaid Jamshed, former lead singer of Pakistani pop band Vital Signs gave up popular music after joining a Sunni missionary group, he sought his ustad’s permission to continue singing one song — a Kishore Kumar song. An amazing act of defiance tells us more about him. When at the height of his power, Sanjay Gandhi demanded that Kishore perform at a stage show to promote the ruling party, the singer refused. It was an act of great bravery, a principled stance. Who said ‘No’ to Sanjay Gandhi during the Emergency? Not even Dilip Kumar, who was seen energetically cheerleading Gandhi’s show. Kishore was typecast as a comedian, and funny stories of his eccentricity are legion. But when he became a director, he chose a very serious subject for his debut. The storyline of Door Gagan Ki Chhaon Mein was sombre. On his return from war, the hero finds that most of his family had perished in a fire, and his son had lost his voice due to the shock. Kishore played a war-hero without the battlefield bravado. It is remarkable that right after the 1962 war with China, he was able to resist the lure of jingoism in a movie about a soldier. He focused on the return of the weary soldier from battle to ‘normalcy’ of life. There are other versions of their story, less charitable to Kishore. The truth? We’ll never know, but it probably lies somewhere in between. 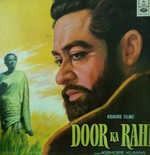 Door Ka Raahi, his third movie as a director (the second, Hum Do Daku, sunk without a trace), too, was very serious, appearing two years after the death of Madhubala. It was the story of a misfit, a habitual do-gooder who tries to spread happiness. Kishore also directed comedies in the 1970s but his Shabash Daddy and Badhti Ka Naam Dadhi were, partly, vehicles to launch his son, Amit Kumar, as actor. These, thus, couldn’t be sad and returning to type, Kishore played the buffoon in them. His third sombre movie, Door Waadiyon Mein Kahin, flopped at the boxoffice. 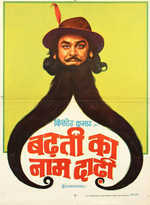 His last movie, Mamata Ki Chhaon Mein, released two years after his death, again had a serious subject at its core. Kishore was a melancholic man; aptly, he began and ended his direction career with sad movies. Kishore, in his own words, was just a “simple-minded villager type”. He was true to this sense of being a villager in his work — his serious movies, all about being “door”, far away, are all set in a village. He thought he belonged there. In contrast, his fame continues to grow and breach geographical and social divides.